Riotur has not yet decided the new locations for the Zona Sul 'megablocos' that attract over 200,000 people. RIO DE JANEIRO, BRAZIL – In 2019, Carnival megablocos that gather over 200,000 people will not be permitted to parade in Rio’s Zona Sul (South Zone). The decision was made yesterday, Monday, May 7th, in a meeting held by Rio’s tourism company, Riotur, with Zona Sul residents’ associations, bloco organizers and public services like CET-Rio and Comlurb. 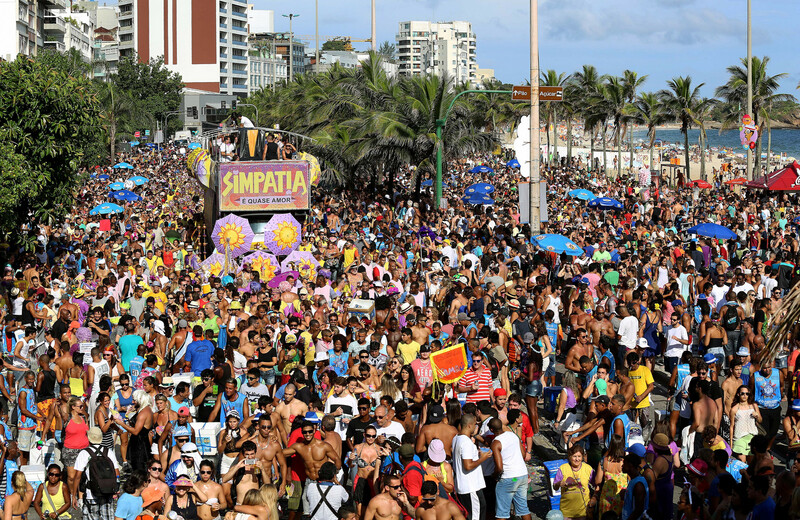 Having paraded at Ipanema beach for over 30 years, the traditional megabloco “Simpatia É Quase Amor” still has no location confirmed for Carnival 2019, photo by Fernando Maia/ Riotur. According to Riotur president Marcelo Alves, Zona Sul’s neighborhoods have no capacity to host big events, such as Carnival’s megablocos. “I can guarantee: Copacabana, Leblon, Ipanema, Botafogo and Flamengo don’t have any condition to support the megablocos. This is already settled. We are now looking for new venues. Today, only Centro works for this end, like Avenida Presidente Antonio Carlos and Rua Primeiro de Março,” explains Alves to media outlet O Globo. Among the new locations suggested in the meeting are Avenida Presidente Vargas avenue, also in Centro, and Praia de Botafogo’s seafront, in Botafogo. Both ideas, however, were discarded due to logistics’ issues. During Carnival, before entering the Sambódromo, all samba schools place their “carros alegóricos” (the themed cars) at Avenida Presidente Vargas – impeding this avenue from being an alternative to the megablocos. Botafogo’s seafront was also disregarded due to the neighborhood’s negative experience with hosting big events in the past. According to Joaquim Dinis, CET-Rio’s director of operations, the big events previously held in Botafogo were responsible for serious traffic congestion across the city and for overloading MetroRio‘s trains. “The blocos destroyed the gardens of Aterro do Flamengo and attracted a huge number of street vendors, who turned the park into a camping field. There was agitation and insecurity. The megablocos should go to Centro, where the police force is more active because of the programs Centro Presente and Lapa Presente,” supported Leila do Flamengo to media outlet Extra. Riotur plans to host another meeting on May 23rd, when the bloco organizers, public services and Zona Sul neighborhoods’ representatives are expected to come up with new locations for the megablocos for Carnival 2019.